Our culture has made it increasingly easy to compare ourselves to others, through Facebook, Instagram, and hundreds of other platforms. But constant comparison only makes us feel like failures: No matter what, there will always be someone who’s at least one step ahead us; and the perfect job, spouse, salary, etc., will always remain elusive. 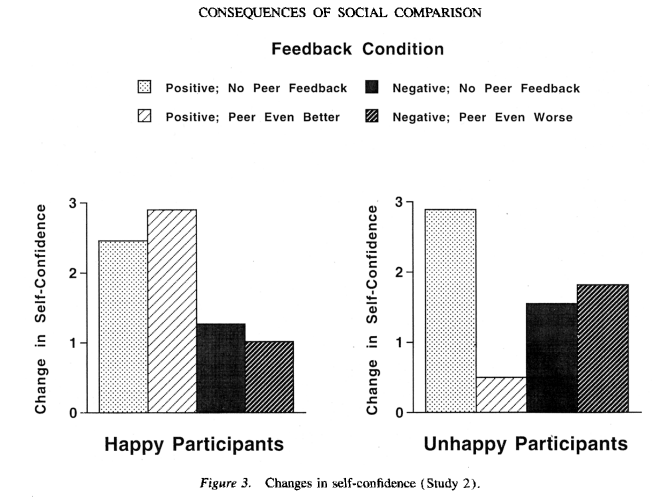 The overall pattern of results that emerged was striking in that unhappy participants showed greater increases in self-confidence after learning that they did poorly but their peer did even worse than after learning that they did very well but their peer did even better whereas happy participants showed smaller increases in self-confidence in the latter condition than in the former condition. While modest comparison to other people makes for healthy competition, those who are consumed by peer comparison are simply choosing to live an unhappier life. THE two and a half miserable hours that Michelle Lam spent in a fitting room, trying on bras, one fine summer day in 2011 would turn out to be, in her words, a “life-changing experience.” After trying on 20 bras to find one that fit, and not particularly well at that, she left the store feeling naked and intruded upon. A screen shot from True&Co’s bra-fitting quiz. A customer starts by entering the size and manufacturer of her current favorite bra. The company then uses an algorithm to try to find a better fit. “It occurred to me in that fitting room, as I was waiting for that saleswoman to bring me bras: Wow, this is the worst shopping experience on earth,” she said. (My wife concurs.) From her frustration that day emerged an idea for a business called True&Co. The history of e-commerce is marked by start-ups devising ways to sell products that were once thought of as unsuitable for sale online. Shoes were not supposed to be something customers would buy online, but then Zappos showed it could be done. The same thing was said about eyeglasses, until Warby Parker came along. But bras, which are among the most personal items someone can buy, represent the Everest of online retail challenges. Ms. Lam’s company opened True&Co last year along with two co-founders, Dan Dolgin and Aarthi Ramamurthy. The company, based in San Francisco, is certainly not the first to sell lingerie online. Older sites include the Web arm of Victoria’s Secret and HerRoom.com, which was founded in 1998, near the dawn of the Age of E-Commerce. Professional bra fitters have also moved online. Linda Becker, whose family owns two bra stores in New York, says she sells twice as many bras online today at LindaTheBraLady.com as she does in her stores. Some of her online customers have previously visited one of her shops and been fitted in person. But new customers take their own measurements and work with customer service representatives on the phone. She says only 10 percent of online orders are returned. True&Co’s innovation is to put a batch of bras into customers’ hands so they can choose what fits best. New customers take a quiz — modeled on the ones in Cosmopolitan magazine that Ms. Lam fondly remembers filling out in high school — to collect the information needed to fit the bra properly. They are then invited to pick three bras in different styles. True&Co uses an algorithm to pick two additional bras to send out, based on what can be discerned from the customer’s choices. So the customer ends up with five bras to try on at home, with no obligation to buy. Most of the company’s bras are priced from $45 to $62. The 15-question quiz asks for the customer’s band and cup size and the manufacturer of her current “best fitting (and beloved) bra,” and works from there to determine how the fit of that favorite bra could be improved. Other quiz questions include: “Do your cups runneth over?” citing things like cleavage or underarms — or “No spills, all good.” The question “What is your shape?” is followed by these choices: Well-Rounded, Bottom Happy, Taking Sides and Bottom & Sides. “We have an algorithm that defines 2,000 body types,” Ms. Lam said. True&Co does not make customized bras for each of those 2,000 body types, however, so much of the taxonomy’s precision is lost when it must be translated into the far fewer combinations of band and cup measurements used by bra makers. True&Co actually makes no patently ridiculous claims about the algorithm, which involves matching a woman’s body type to a particular bra based partly on consistent variations among manufacturers for a given size and style. One manufacturer’s 32C may work better for breasts of a certain shape, for example, even if a woman is used to buying a 34B. Customers buy an average of two bras from each batch of five. The company says women end up buying more of the bras chosen by the algorithm than the ones they select themselves. But as with shoes and eyeglasses, so too with bras: it’s love at first touch and try, even in the digital age. The volunteers who were happy before the puppeteering review cared a bit about hearing that they had performed worse than their colleagues but largely shrugged it off. The unhappy volunteers were devastated. Dr. Lyubomirsky writes: “It appears that unhappy individuals have bought into the sardonic maxim attributed to Gore Vidal: ‘For true happiness, it is not enough to be successful oneself. … One’s friends must fail.’ ” This, she says, is probably why a great number of people know the German word schadenfreude (describing happiness at another’s misfortune) and almost nobody knows the Yiddish shep naches (happiness at another’s success). Max Nisen| BUSINESS INSIDER.Apr. 19, 2013. At least in an abstract sense, many people associate a deep voice with authority, power, and seriousness. Exactly the things one would expect or hope for in a CEO. A new study, “Voice Pitch Predicts Labor Market Success among Male Chief Executive Officers” from William J. Mayew and Mohan Venkatachalam of Duke University, and Christopher Parsons of UC San Diego, takes a look at the voice pitches of CEOs of large public companies, and found this to be true. A CEO’s voice that becomes lower by a 1% decrease in the pitch correlates with $30 million more in assets for the company they manage, and a $19,000 increase in their salary. Those on the deepest end of the voice scale run companies that have $440 million more in assets and earn some $187,000 more. Deeper-voiced CEOs were also found to stay at their jobs longer. The average CEO in the study comes in at 125.5 Hz, which is about average for an adult male. By way of comparison, James Earl Jones, famously the voice of Darth Vader, has a voice pitched at around 85 Hz. The effect is more pronounced when a CEO has more decision-making power or discretion, and was separate from experience, education, and age. It’s easy to be skeptical about the idea. 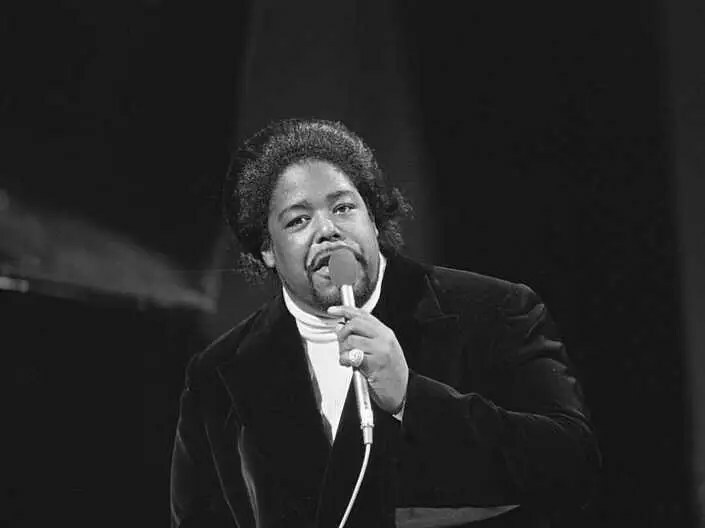 But it turns out there’s a fundamental biological advantage to having a deep voice. Women find deep-voiced men more attractive, they father more children, and they’re viewed as more socially and physically dominant. There’s not much you can do to change the natural pitch of your voice, but it might be worth curbing a tendency to speak higher or faster when excited, and try to speak slower and lower. 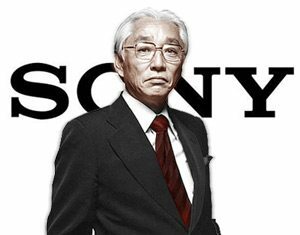 Japanese businessman and co-founder of Sony “Akio Morita” was an innovator of high quality electronics, selling billions in revenue around the world. 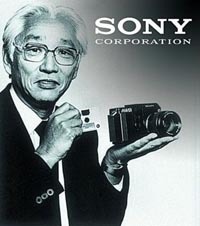 Akio Morita’s business strength was in his ability to understand both Western and Eastern cultures and combine the best of both worlds to globalize Sony as a household name. In 1966, Morita wrote a book called Gakureki Muyō Ron, which means “Never Mind School Records“, where Akio stresses that school records are not important to success or one’s business skills. So what skills are important for achieving success? Akio Morita shares his advice for breaking down barriers in the business world. Carefully watch how people live, get an intuitive sense as to what they might want and then go with it. Don’t do market research. I knew we needed a weapon to break through to the U.S. market, and it had to be something different, something that nobody else was making. On November 25, 1994, Morita stepped down as Sony chairman after suffering a cerebral hemorrhage while playing tennis. 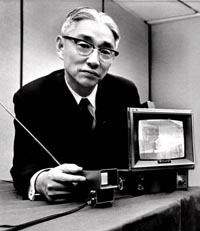 He was succeeded by Norio Ohga, who had joined the company in the 1950s after sending Akio Morita a letter denouncing the poor quality of the company’s tape recorders. Instead of taking offense, Akio saw a talent in Norio and decided to hire him for his honesty and keen eye for improvement. On October 3, 1999, Morita died of pneumonia at the age of 78. Although Akio is no longer with us, his story and his knowledge of transforming the business world still lives on. The curious history told in 19th and early 20th century mothering advice books is a mix of unreasonable demands and unfounded claims. At the same time, though, one can see how it made sense. I recently visited my friend Julia, mostly to nuzzle the head of her newborn, Eloise. As Julia and I talked, I shifted Eloise to lie on my stomach, facing the large television that dominates Julia’s living room. What Eloise has, like most babies, are good parents. Good parents, especially first time parents, seek advice. Julia and her husband are following the American Academy of Pediatrics’ recommendation that screen time for babies is unhealthy. They have a fat stack of parenting guides sitting in their daughter’s carefully assembled nursery, full of similar information that can help them care for a person who has very specific needs which she can’t communicate. The market is pretty much choking on baby care books today. The a phenomenon seemed to launch in the 1950s with Dr. Benjamin Spock’s Baby and Child Care. While his child-rearing advice reached the largest audience in history, he was by no means the first to put rules for infant care in authoritative print. The business of instructing mothers on how to do their job really bloomed in the 19th century. If you’re a fan of peculiar history, you won’t do better than 19th and early 20th century mothering advice books. They are conglomerations of pseudoscience, unreasonable demands, and authoritative statements without foundation. At least they seem so now. Well, you can’t prove they’re not, can you? And what would it hurt to play it safe, just in case? “Pregnant mothers should avoid thinking of ugly people, or those marked by any deformity or disease; avoid injury, fright and disease of any kind.” This was written in the 1920s, in a book called Searchlights on Health: The Science of Eugenics, by B. G. Jefferis and J. L. Nichols. It’s interesting to note that a remarkable number of parenting manuals from the era used the word “eugenics.” This was before it had come to be mean, “something Hitler was really into.” To them it had positive connotations, related to increasing the strength and qualities of the next generation, and less to do with stamping out the impurities of mankind for the propagation of the Master Race. These books were written well into the scientific age, by men who claimed to possess scientifically collected knowledge. It shows how deeply bewildered and susceptible parents were as the world changed around them, and how tightly the old wives’ tales still gripped people’s minds. Who wanted to be the first to contradict them at the peril of their child? Still, that sort of counsel represents the more fringe advice of the era. There might have been almost as many people rolling their eyes at it then as now. It was the advice they actually followed that is truly disturbing. So much so that you begin to wonder how anyone survived a 19th century childhood without emerging as a hardened sociopath. As the child grew, regulated contact could be tolerated. “At the age of two weeks, the child may be systematically carried about in the arms 2 to 3 times a day, as a means of furnishing additional change in position,” is the precise advice of Dr. JP Crozer Griffith in 1900. Even bowel movements were regimented. “Children under one year of age should have two movements of the bowels in the twenty-four hours, and those from one to three years at least one stool a day,” wrote Napheys. Should the baby not conform to these healthy perimeters, the same books prescribed any number of enemas, draughts, and oils to make things more shipshape. We run into many snags when we undertake to discipline the nervous baby. The first is that it will sometimes cry so hard that it will get black in the face and may even have a convulsion; occasionally a small blood vessel may be ruptured on some part of the body, usually the face. When you see the little one approaching this point, turn it over and administer a sound spanking and it will instantly catch its breath. There comes a time in every parent’s journey, when, after doing everything they can, they simply must close the door on a secured but screaming baby and walk away. Few make a habit of it, and fewer still would see their newborn’s face turning black and convulsing with ruptured blood vessels as a “snag” worthy of a spanking. According to the CDC, in the year 1900, 10 to 30 percent of all American babies born died before their first birthday. They died from things we don’t think about. They died because their drinking water was too close to their sewers. Because the cow’s milk they drank was unpasteurized. They died of measles and whooping cough and all the diseases that now cause four minutes of hard crying in a nurse’s office and a Batman Band-Aid, instead of death. That was the time these writers, and the mothers they wrote for, lived in. They didn’t know why their babies died, or screamed, or sickened; and they clung desperately to anyone who claimed to have the knowledge to prevent it. “Why do you think mothers were told not to pick up their babies when they cried?” she asked me. As a mother myself, I have always been astounded by my ability to stop another human’s suffering with only my arms, and could not fathom any mother feeling differently. Yet my mind provided a wordless answer, a picture, almost immediately. A kitchen at the turn of the century, a heap of soiled clothes by a washboard, a dead chicken waiting to be scalded and plucked, countless other children bringing their chaos and noise to their mother, a husband plowing far out in the back forty and a grandmother who stayed back east. Necessity mixed with fear and little solid information to quell it. This all added up to parenting practices that would drop the jaws of modern devotees of What to Expect When You’re Expecting. The books themselves, childcare manuals that bloomed in the 19th century and never let up, came into play for two reasons, according to Dr. Apple. First, the mid-1800s saw the rise of the male pediatrician and obstetrician. Never before in history had men of medicine taken an active interest in the care of common children and women. To establish themselves and prove that they were better than the lowly midwife, they wrote books, emblazoned with the powerful letters following their names. “MD, FRS, DCI.” The reader may have no idea what those letters actually meant, but they were nonetheless comforted that the advice they were getting was expert. The second reason was what Dr. Apple calls “mobility.” You no longer lived your whole life in the same town that your forefathers had founded and died in. You moved for better work, you emigrated west; you set up homesteads in places where your nearest neighbor was 640 acres away. Your mother and aunties weren’t around to advise you. At the same time, your family was smaller than it had ever been, meaning you were less likely to have seen others care for babies. Dr. Apple’s view that today we only have more details, not full answers, resonates. Parents are still all too aware of what they don’t know. Fear still sells. The mortality rate of American babies today is infinitesimal compared to any other time in history. We no longer worry about diphtheria or a mother’s argument with a neighbor poisoning her breast milk. So we find different things to worry about. Things that even the most exhaustively detailed books of yesteryear would never even have considered. Should drop-side cribs be banned? Which chemicals might be seeping into my child’s liver through the plastic in her sippy cup? What’s worse for baby: formula feeding, or just directly feeding it lead paint chips? There is one thing we tend to forget with our babies as we look down on them in their cribs, hoping the wispy rise and fall of their chests will continue even after we look away, and genuinely afraid that it won’t. Babies want to live. They want to thrive. No matter what new wave in parenting washes over them, they adapt. In 100 years historians may be disgusted by our use of diapers, and click their tongues over our ignorance of subatomic particles as they relate to cognitive development. They will be around to judge our folly because they survived it, just as our grandparents survived the incomplete information their parents had. I left with Eloise snuggled onto her mother’s chest, sleeping in contentment. A safe child, whose parent’s love is delivered in the fashion becoming the 21st century. Though it might be more gentle and attentive, it is no less a love than has ever come before. The research behind an understanding that natural environments refocus our attention, lessening stress and hastening healing. Paoli, Pennsylvania, is a small town with a local suburban hospital. Patients at Paoli Memorial recover in a row of rooms facing a small courtyard. In the early 1980s, a researcher visited the hospital and gathered information about patients who had undergone gallbladder surgery between 1972 and 1981. Gallbladder surgery is routine and generally uncomplicated, but most patients in the 1970s recovered for a week or two before they returned home. Some took longer to recover than others, and the researcher wondered whether subtle differences between the hospital rooms might explain this discrepancy. Some of the rooms on one side of the hospital faced onto a brick wall, whereas others slightly farther down the corridor faced onto a small stand of deciduous trees. Apart from their differing views, the rooms were identical. People who are exposed to natural scenes aren’t just happier or more comfortable; the very building blocks of their physiological well-being also respond positively. When the researcher looked at their recovery charts, he was struck by how much better the patients fared when their rooms looked out onto the trees rather than the brick wall. On average, those who faced the brick wall needed an extra day to recover before returning home. They were also far more depressed and experienced more pain. On average, their nurses recorded four negative notes per patient — comments like “needs much encouragement” and “upset and crying” — whereas those with a view of the trees warranted negative notes only once during their stay. Meanwhile, very few of the patients who looked out onto the trees required more than a single dose of strong painkillers during the middle part of their stay, whereas those facing the wall required two or even three doses. Apart from their view, the patients were very similar, and they had received identical treatment at the hospital. Each patient with a view of the trees was matched with a patient whose room looked out onto the brick wall, so that their age, gender, weight, status as smokers or nonsmokers, and attending doctors and nurses were controlled as tightly as possible. Since those factors were controlled, the only explanation was that patients who looked out at a stand of trees recovered more quickly because they were lucky enough to occupy rooms with a natural view. These results are surprising because the effects are so large — much larger than the effects of many other targeted treatment interventions. By some measures, patients who gazed out at a natural scene were four times better off than those who faced a wall. Strong results usually inspire skepticism, but plenty of studies have shown similar effects. In one of those studies, two environmental psychologists approached 337 sets of parents who lived with their children in five rural communities in upstate New York. They scored the “naturalness” of each family’s home, awarding points for natural views, indoor plants, and grass-covered yards. Some of the children had experienced little stress growing up, rarely fighting or getting punished at school, but others were bullied and struggled to get along with their parents. When the researchers measured the happiness and well-being of the students in their study, they noticed that those who had experienced hardship were distressed and lacking in self-esteem — except when they lived in more natural environments. The presence of nature seemed to buffer them against the stresses that hampered other children who lived in predominantly man-made environments. In an even more direct test, researchers asked a hundred sets of parents with children who suffered from attention deficit disorder how their children responded to different playtime activities. Children who have ADD are often restless and distracted. But the parents reported that green activities — like fishing and soccer — left their children in a far more relaxed, focused state. It wasn’t that the children who spent time outside were merely happier, more likely to interact with friends, or more active — in fact, those who sat indoors, in a room with natural views, were calmer than children who played outside in man-made environments that were devoid of grass and trees. What is it that sets natural environments apart from others? Why shouldn’t a quiet streetscape have the same effect as a quiet natural landscape, for example? Architecture has its own beauty, and some people prefer urban environments to natural environments, so why does nature alone seem to have such powerful restorative effects? The answer is that natural environments have a unique constellation of features that sets them apart from man-made locations. Just before the dawn of the twentieth century, William James, one of the early giants of modern psychology, explained that human attention comes in two different forms. The first is directed attention, which enables us to focus on demanding tasks like driving and writing. Reading a book also requires directed attention, and you’ll notice that you start to zone out when you’re tired, or when you’ve been reading for hours at a time. The second form is involuntary attention, which comes easily and doesn’t require any mental effort at all. As James explained, “Strange things, moving things, wild animals, bright things, pretty things, words, blows, blood, etc., etc., etc.” all attract our attention involuntarily. Forests, streams, rivers, lakes, and oceans demand very little from us. Nature restores mental functioning in the same way that food and water restore bodies. The business of everyday life — dodging traffic, making decisions and judgment calls, interacting with strangers — is depleting, and what man-made environments take away from us, nature gives back. There’s something mystical and, you might say, unscientific about this claim, but its heart actually rests in what psychologists call attention restoration theory, or ART. According to ART, urban environments are draining because they force us to direct our attention to specific tasks (e.g., avoiding the onslaught of traffic) and grab our attention dynamically, compelling us to “look here!” before telling us to instead “look over there!” These demands are draining — and they’re also absent in natural environments. Forests, streams, rivers, lakes, and oceans demand very little from us, though they’re still engaging, ever changing, and attention-grabbing. The difference between natural and urban landscapes is how they command our attention. While man-made landscapes bombard us with stimulation, their natural counterparts give us the chance to think as much or as little as we’d like, and the opportunity to replenish exhausted mental resources. Healers in Japan and Germany have long heralded the benefits of natural therapy, recognizing that humankind has spent 99.99 percent of its history living in natural environments. The Japanese version of natural therapy is shinrin-yoku, or forest bathing, which requires that patients walk for extended periods through forested areas while inhaling woodsy scents that complement the sylvan atmosphere. German Kneipp therapy similarly requires that patients perform physical exercises in forest clearings. These alternative therapies aren’t just idle cultural quirks, and researchers have found that patients enjoy a wide range of benefits. Among others, compared with people who walked through urban areas, shinrin-yoku patients had lower blood pressure, lower pulse rates, and lower cortisol levels, a marker of reduced stress. People who are exposed to natural scenes aren’t just happier or more comfortable; the very building blocks of their physiological well-being also respond positively to natural therapy. Natural environments promote calmness and well-being in part because they expose people to low levels of stress. These stressful experiences are tame in comparison with the trials and tribulations that most of us associate with stress — workplace drama, traffic jams, and wailing children on international plane trips. Humans thrive with some stimulation, but we’re incapable of coping with extreme stressors, which push us from the comfortable realm of eustress (good stress) to the danger zone of distress (bad stress). Interesting locations, including busy natural environments, are so beneficial that physicians have begun to suggest that they might offer a cheap and effective way to lessen the effects of certain cancers. One team of researchers showed that women who were recently diagnosed with early-stage breast cancer were far more capable of completing challenging mental tasks when they immersed themselves in natural environments for two hours each week for approximately two months. The interventions began when the women were diagnosed, and continued beyond surgery into the recovery period. Like many distressed patients who begin to battle life-threatening illnesses, the women struggled to complete difficult mental tasks shortly after they were diagnosed. Those who spent time in natural environments improved progressively, regaining their capacity to devote attention to demanding mental puzzles. Meanwhile, the patients who were not exposed to the nature-based intervention tended to struggle with similar tasks throughout the test period. Attention is obviously a long way from recovery, but patients with sharper minds often respond better to treatment, stick to their treatment regimens, and behave more proactively during recovery. Of course, nature is not a panacea, but it’s an inexpensive and effective tool for dampening the impact of illness, and dulling the intrusion of everyday stress.